I'm not bitter about Valentine's Day and my lack of a date - I'll just pet my dogs and cat and drink lots of delicious bourbon by the fireplace. But if I were going out to an event or a dinner date, I'd want something dark, red, new and festive for the occasion. 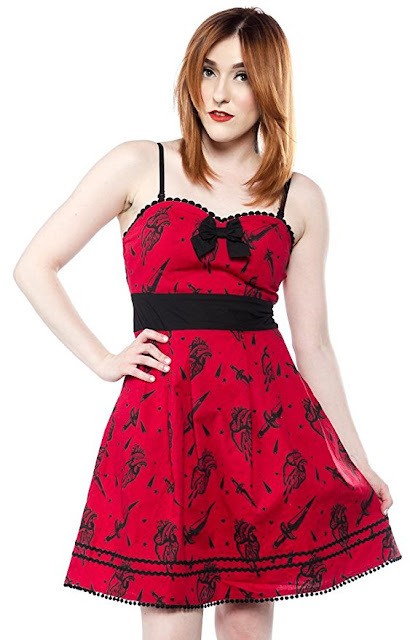 Here's a couple dresses from Sourpuss, new for the occasion, that you might want to check out. Sourpuss's new "Fatally Yours" dress features artwork from Philly tattoo artist Kyle Fitzpatrick. The black-and-red print features a dagger and a bleeding heart that's apparently been stabbed. 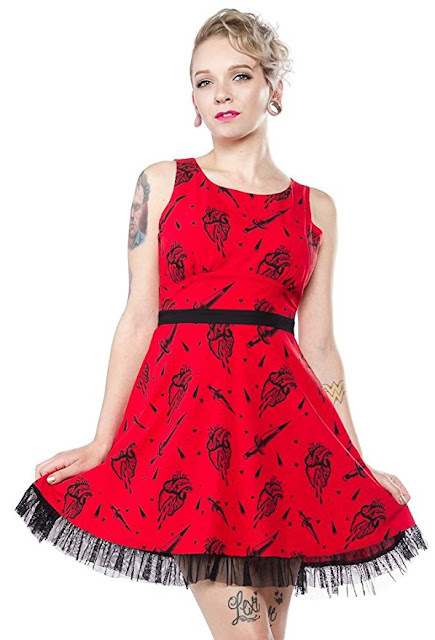 The same daggers-and-hearts fabric was used to create Sourpuss's new "Brokenhearted" party dress. Which of the two is your favorite? Let me know in the comments below.